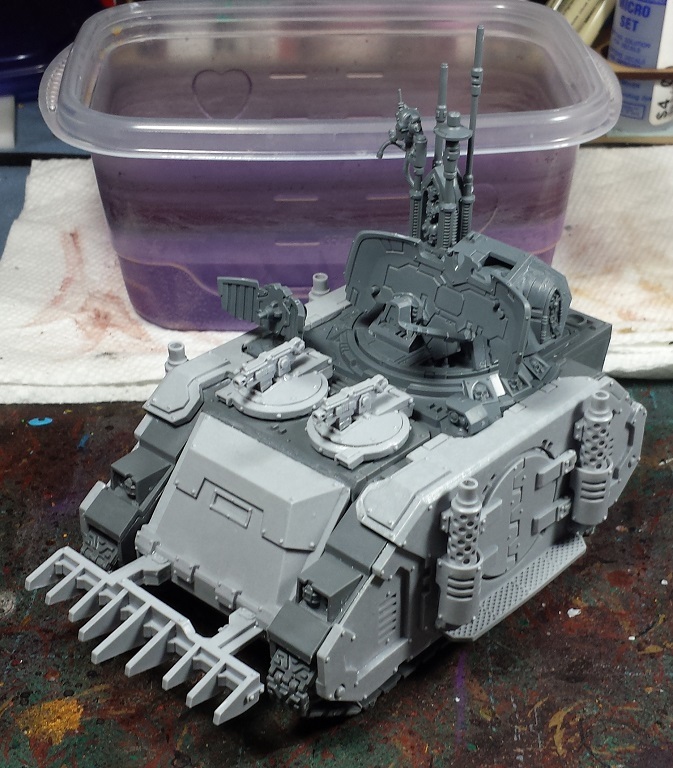 Mordian 7th Regiment: Heresy Era Thousand Sons - Damocles Command Rhino and Techmarine, and some GenCon goodies! 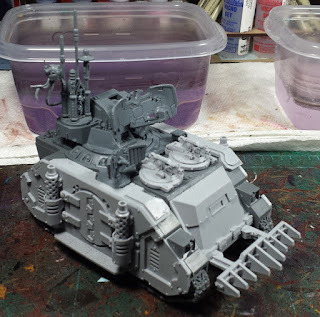 Heresy Era Thousand Sons - Damocles Command Rhino and Techmarine, and some GenCon goodies! Apologies for the radio silence of late, but I've been on vacation for the last week out in Indiana attending GenCon! A fantastic time was had, and there's a few pics below. First up however are some pics of a few models I'd been working on here and there over the days leading up to the trip and a little bit today. AS is usually the case I keep fiddling with army lists for NOVA and had a thought to include a Damocles Command Rhino to the force, which would allow for more deep strike accuracy for the assault squads, and the occasions where I can pull off the roll on the Warlord Traits table where I can designate the terminators with deep strike. I knew I wanted to use the Warhammer World exclusive command rhino, and spent a little time cutting up a Deimos rhino kit from Forge World to give it that Heresy vibe. As a unit to pop in the Damocles, I put together a Techmarine and a unit of Servo-Automata, pretty straightforward headswap for this guy, though I'm scheming on a more ornate Forge Lord for the near future! While I was out at GenCon we mostly spent our time playing Shadowrun and enjoying delicious meals and probably a few too many cocktails. I was able to swing by the Forge World booth though, and to the great relief of my wallet there wasn't really much that I needed to buy to supplement the Thousand Sons - With the book's release imminent I'm sort of holding off on buying new kits until I can see the army list and new models. 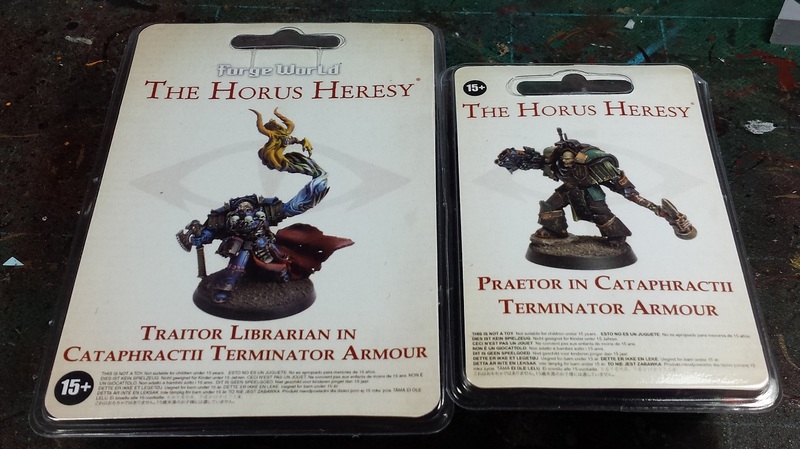 That said, I did pick up a couple of the Event Only models - The Traitor Terminator Librarian, and the Cataphractii Terminator Praetor with a Thunder Hammer and Combi-Volkite. The Librarian is a bit too World-Eater-y to use for the Thousand Sons, but he'll be squirreled away for a rainy day! Lovin' that Tech Priest and his servo dogs; can't wait to see you get them painted up my man. Glad you enjoyed Gencon and got some time away. Absolutely lovin' that rhino command post. Hummm. Would have loved to have you at the Team Tournament Friday! Oh i like everything about these! The techmarines armor is just sick. I love it! Techpriest looks cool. Never seen the servo-thingies before, but I like how they are all skulky and stuff. Very impressed with your restraint! Past years, your wallet was screaming! @Rory Priest: Indeed, a vacation was much-needed! Back to the paint mines for me! @Zzzzzz: Aye, it's a fun piece of kit - I rather like the more ostentatius look it has over the 'standard' Damocles! @A.: Indeed, looking to set aside some time for some minis at next year's GenCon! @Greg Hess: Aye, It's the Mk.III techmarine from FW - nice and chunky! 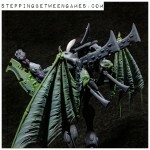 Funny, when I think "World Eaters" I usually don't think "Librarians" but you're right, he's very bestial-looking. 40k Deathwatch - Corvus Blackstar built!